Every year Australians get through about 230 kg of paper products per capita, making our nation one of the world leaders in paper consumption. The production of all this paper has major environmental impacts. The most obvious is the felling of trees, but the effects go far beyond deforestation. For example, huge amounts of water are used in paper manufacturing. Then there’s the smorgasbord of environmentally hazardous chemicals released into our air and water, including ammonia, mercury, benzene and carbon monoxide. There’s also the energy needed for every step of the process, from logging to production and distribution, and the resulting greenhouse gas emissions from all this energy use. Plus there’s a hidden environmental impact that can linger for years. Paper that ends up in landfill slowly decomposes, releasing large quantities of methane — a greenhouse gas 84 times more potent than carbon dioxide! Dreams such as the ‘paperless office’ are still a long way off. 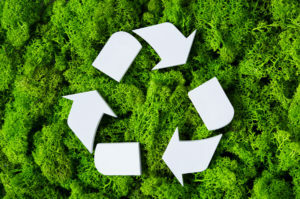 Recycling paper causes 35% less water pollution and 74% less air pollution than producing new paper. Greenhouse gas emissions are far lower, and landfill reduced. Using a document shredding service makes recycling your paper documents safe and easy. You are not only ensuring documents are completely and securely destroyed, keeping yourself and your customers safe from identity theft, industrial espionage, corporate fraud and other threats. You’ll also be taking a big step towards reducing the environmental footprint of your business. All recyclable documents we process are reduced to tiny fragments through comprehensive cross-cut shredding, ensuring total destruction of sensitive data. We provide a security guarantee along with a certificate of destruction. Finally, the destroyed documents are transferred to a paper recycling facility, where they will be recycled into new paper products. Contact EShred today on 1300 629 875 to find out how easy to use, secure, cost-effective AND environmentally responsible our services are.